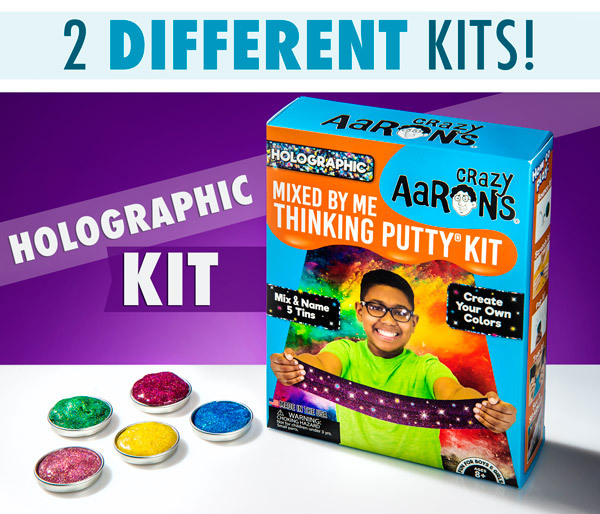 Mixed by Me Putty Kit: Make your own Crazy Aaron’s incredible Putty! Crazy Aaron’s putties have been some of the most popular items ever sold at Vat19, and with good reason. 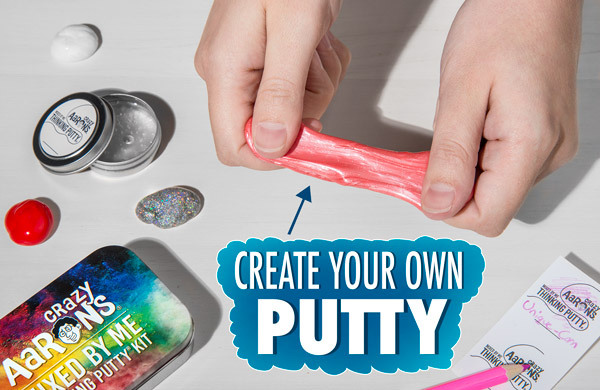 You can stretch it, bounce it, tear it, and sculpt it—and now you can make it yourself with the Mixed by Me Putty Kit. The kit includes five small tins of clear putty and several colors and effects to help you customize them. Mix the red, yellow, and blue color or glitter concentrations into the clear putty to create the hue that’s just right for you. Then add an effect that adds sparkle or glow-in-the-dark properties to the putty and work them into the clear putty by stretching and folding. Once you have your new putty, you can decorate the lid and give it a name using the included colored pencils. Then comes the really fun part—playing with your new creation! Please note that the packaging of the Mixed by Me Putty Kit has changed slightly since this video was made. The Mixed by Me Putty Kit is now available in a Holographic style. When this video was made, only the Glow in the Dark style existed. From our cars to food and even clothes, we customize the things that mean the most to us because we’re all different. 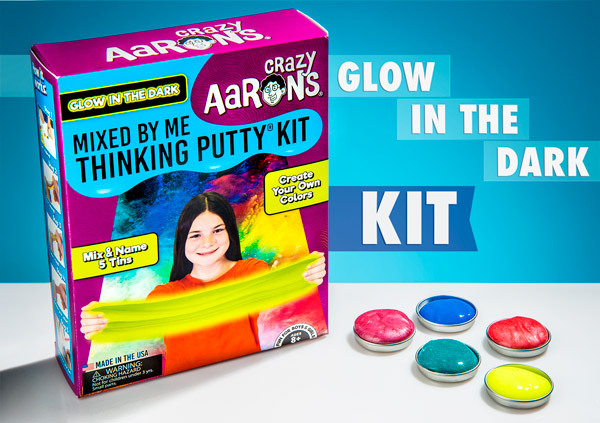 The Mixed By Me Putty Kit from Crazy Aaron gives you the chance to customize playtime. The set has everything you need to craft your own color, effects, and even design your own tin label. Each kit includes five mini tins of putties, so after you make one amazing creation, you can try to best yourself on the next four. Because we are all unique snowflakes. If putties were people, then color would be its wardrobe. Dress up your moldable play thing in blue, yellow, or red, or mix the colors together to get your favorite hue. The colored concentrate is easily folded into the original clear putty and will quickly change its color. Put in a small amount to give the putty a frosted look or go all in for a solid color. It’s like a stretchable rainbow! Again, if putties were people, their effects would be their personalities. Fold in glow-in-the-dark, shimmer, or glitter effects to make your creation both fascinating and fun. Just like the colors, the effects can be combined to make a glowing, sparkly, and shimmery masterpiece. Try different combinations and see what kind of cool looks you can craft. Remember, you only need a pinch of the effects and colors to create something amazing. Make your mark on your custom creation with the included colored pencils and labels. Once you have finished making a putty you can be proud of, add the sticker to the tin and give it a clever name. 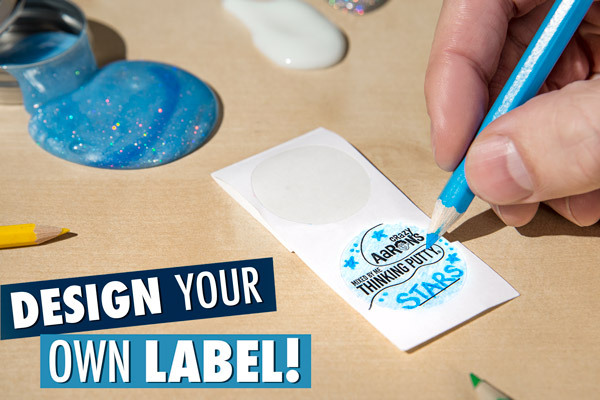 Complete the label using the included blue, red, green, purple, pink, and yellow colored pencils so your putty will look fantastic inside and out. A good putty needs a good name. 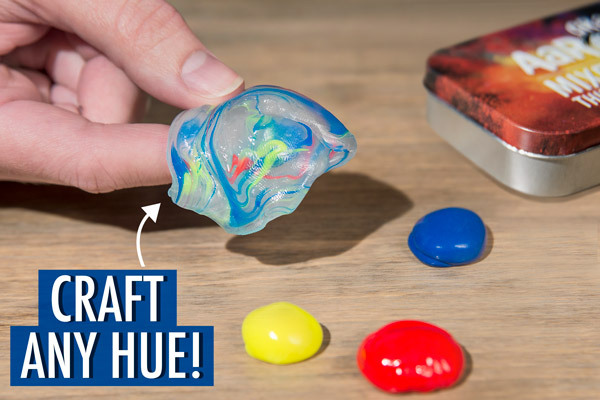 Watch as members of the Vat19 video team explore the Mixed by Me Putty Kit for the first time. In episode #9 of Peep This, Jon and Joey unbox the Mixed by Me Putty Kit. 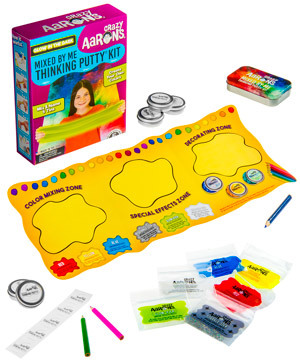 Everything you need to make the next great putty is included in this kit. 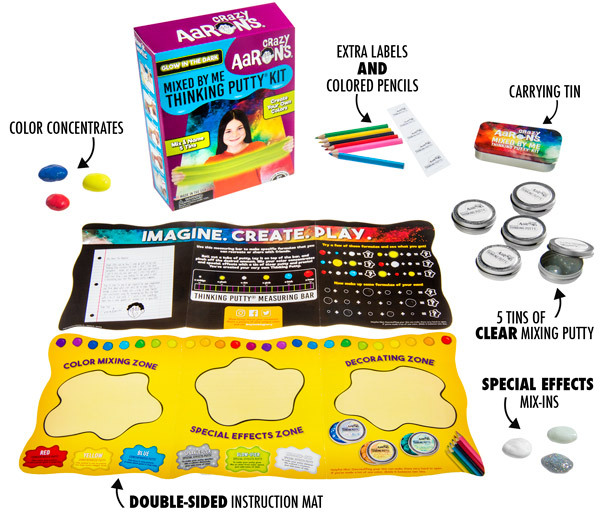 Along with the five tins of clear putty, color concentrates, effects mix-ins, colored pencils and label stickers, there’s also a double-sided instruction mat. It will guide you through the process of designing a putty by explaining what effect the elements will have depending on the amount you use. Set up your own putty factory! The Mixed by Me Putty Kit is available in two different styles: Glow in the Dark and Holographic. Each lets you mix different types of awesomeness into your putty. With the Holographic kit, you can create putties that dazzle thanks to yellow, magenta, and cyan sparkle concentrates which you'll mix and pair with opal-izer, mystify-er, and holo-izer effects for your own uniquely colored and uniquely shimmering putty. The Glow in the Dark kit is equally awesome in its own way. In addition to red, blue, and green color concentrates, this set includes three special effect mix-ins: sparkle-izer, shimmer-izer, and glow-ifyer to super-charge your custom putty. Both kits include 5 tins of clear putty, 6 colored pencils, 5 customizable tin labels, and a mixing mat with ideas for color formulas. Question: Will this putty act like other Crazy Aaron’s putty when I’m done? Answer: Yes. While the quantity of putty in each tin is smaller, you will still be able to bounce, stretch, tear, and sculpt your creations. Question: After I have made a putty, can I change it by adding a color or effect later? Answer: Absolutely! Until all of the effects and colors are gone, experiment with new looks as much as you want (because the putty never dries out)!